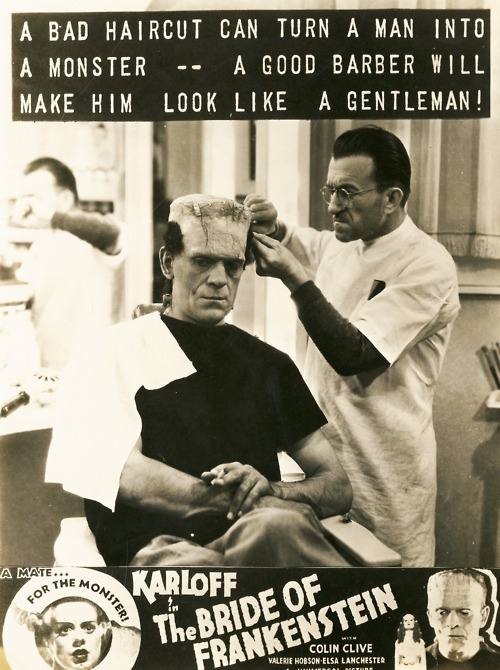 Twenty five years after he first started pushing up daisy's (think about it), some idiot in a suit thought it would be a pretty good idea to stick Béla Lugosi in a television commercial. After all, who better to sell the Count Chocula breakfast serial than the good Count himself! I mean, it must beat a cartoon facsimile! Yes. That is correct, fellow horror hounds. Frankenstein loves steak sauce. 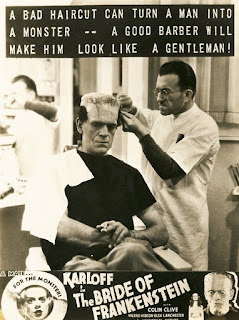 Or if you prefer, Frankenstein, also known as Boris Karloff, also known as William Henry Pratt, loves nothing more than to smother his food with chemically induced flavorings concocted by scientists in a lab. Now doesn't that sound bloody lovely to you? Of course it does. And it did too, to old Boris himself, who must have made this ad a year or two before his passing, in 1969. In this, the first of two Holsten Pill ads, you'll get to see how a master of suspense, namely, Peter Cushing, manages to dip the English Comic, Griff Rhys Jones, into a pit with a flick of a switch. Years later, Griff would go on record and say that he felt a bit silly making this advert, feeling that it was disrespectful to Peter's good name. Have you ever wondered where serial killers and maniacs go when they're out of work? No. They don't go working at the local thrift store, silly. Thrift stores don't pay enough. What they do instead, is to co-star in a television commercial starring Freddy Krueger himself, Robert England. I mean, it must beat a cartoon facsimile! In the same year he tragically lost his life to heart failure, Christopher Lee gave up some of his time to help promote the worthwhile cause, AGE UK. When you can, please click on this advert and try to take in what he's trying to say. To me, life, any life, is always precious and always worth maintaining, no matter the cost. Wow! That last segment was a pretty intense one, wasn't it horror hounds? So like me, you too must also now fancy having a drink, especially after watching that! So I tell you what, how about us asking our pal Donald Pleasence to fetch us both a nice cool pint of Holsten Pills. It must be a lot better than having his head chopped off. After a busy day of killing zombies and having your own hand chopped, what better way is there for someone to relax other than to sit down behind the piano, twinkling the ivories, whilst being accompanied by a number of delectable dames? Particularly if you're Bruce Campbell. Right, Old Spice Advert? Back in the 1900's, when a young Vincent Price was walking along the busy streets of Saint Louis, Missouri, I don't think for a single minute he could have been able to guess what would have become of him. What with his name etched twice on the Hollywood Walk Of Fame. What with his roles on TV, Film, and Theater. Plus lets not forget, promoting head cleaners for VHS cassettes.